Published April 10, 2011 at 500 × 750 in Altered Text for Sunday Sketches. 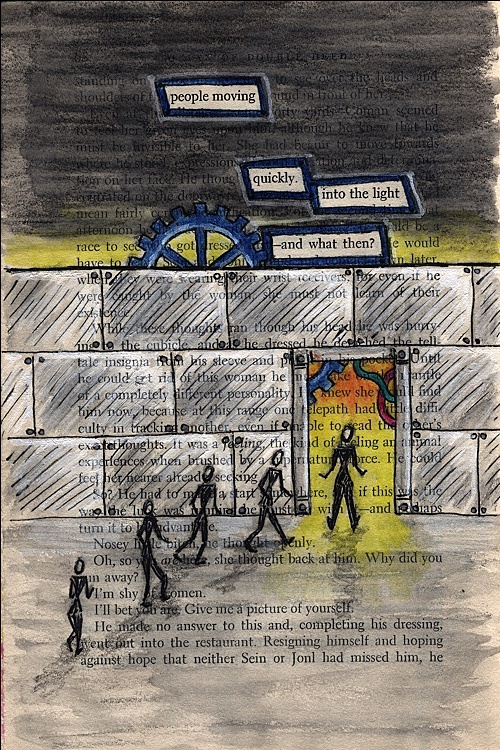 this is so sool, I want to start sketching in my books now, I started some altered books a few years ago then gave it up as I wasn’t happy withwhat I added… thanks for sharing! i like the mixed media here, and your words! What a neat idea! I never thought of doing something like this. I’m always finding used books at the library and Goodwill. I’ll have to keep an eye out for some poetry books. 🙂 Thanks for the idea! Deanna – It doesn’t need to be a poetry book. It can be any kind of book. Neither of mine are poetry. It doesn’t even have to be a good book, as the story in this particular one is just awful, LOL! Poetry and art… very creative. Love the name of your blog too! Thanks for stopping by for a visit! Happy Spring!